In PPC, it is sometimes wise to look at what the ‘big guns’ are doing with their PPC campaigns in order to gain some ideas what you should do with your own campaign. Again, you will have heard it a million times before if you have read previous articles of mine. The most important aspect (from my perspective) of a PPC campaign is the landing page. It is where your conversion is produced. It is the ‘make or break’ part of the campaign. Therefore, it will be very useful seeing the different types of landing pages different market leaders are using for their campaigns. Below are descriptions of the different landing pages different businesses are using for their landing pages. From this, we can establish that this landing page can be seen as an infomercial page. 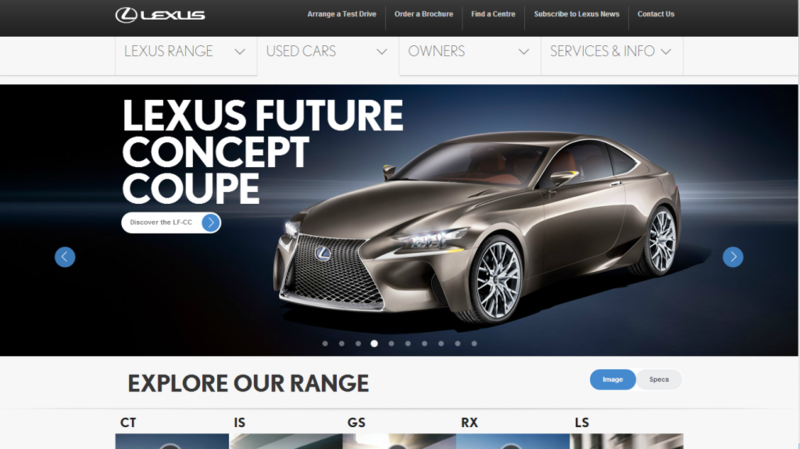 It’s objective is to notify the web user with as much information as possible about Lexus cars. In this case, Lexus is trying to tell the web user about it’s car range from the wonderful looking concept cars to present day cars for sale. The main picture is on an automatic slideshow helping to pump as much information to the web user as possible. This provides the tip that if you want to give as much information as possible to the web user from a landing page, use an automatic slideshow. As well as looking elegant, they are also extremely effective too. It is clear before I even analyse the landing page that it is going to be a click through page. The only way Sainbury’s can make money from this PPC campaign is through getting web users to click through the landing page and start shopping for groceries online. Therefore, the information on the landing page is only what the web user needs to give them the incentive to click further into the page. If this was an infomercial, the web user will most likely click away because they will be put off with the amount of information they are receiving. 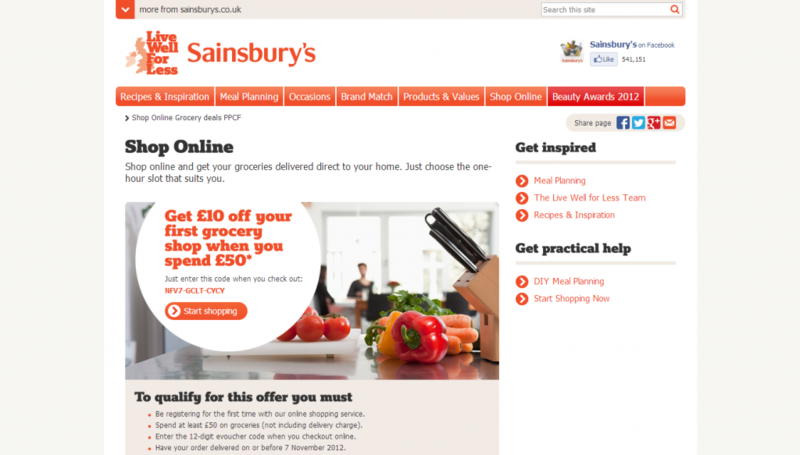 With this landing page though, Sainbury’s have used a simple and plain design along with little information. The information they do include is helpful in motivating the web user to progress to the next step and click through. Sainsbury’s have included a special offer that the web user can use. Therefore, if you are looking to have a PPC campaign with a click through landing page, always think, ‘what incentives am I giving the web user to click further into my landing page?‘ Always provide an incentive for click through landing pages. It can be argued that this landing page is in fact a click through page from the fact that there are sport clothing and shoes you can purchase through clicking through the landing page. 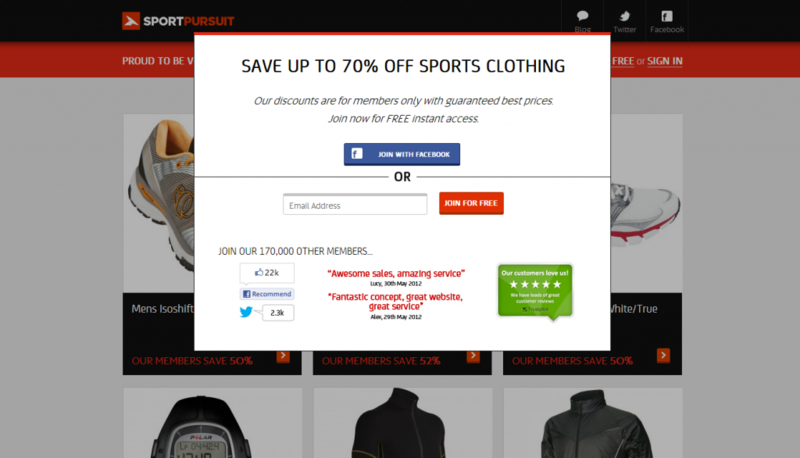 However, as soon as I entered onto Sport Pursuit’s landing page, I am greeted by a pop-up wanting my information. Therefore, Sport Pursuit values the information of customers such as email addresses to make them members and provide email marketing to. The majority of lead capture pages do ask for emails so they can email you for special offers etc. Therefore, it may be wise to try and ‘spice’ up your landing page if it is a lead capture page. Do something different with it. Don’t follow the stereotype and ask for emails because you may find your landing page more effective when asking for other information away from people’s emails. Do Site Targeted Campaigns REALLY Work??? Share your comment 2 responsesTO Who Uses What Landing Pages?. This is a simple post, yet informative. It’s nice to see different types of landing pages so any business can look at their own website and see what fits best for them. At least that’s what I initially thought of when I saw it. Thanks! Your welcome. It sometimes good to gain clarity in the type of landing page you are using in your campaign.